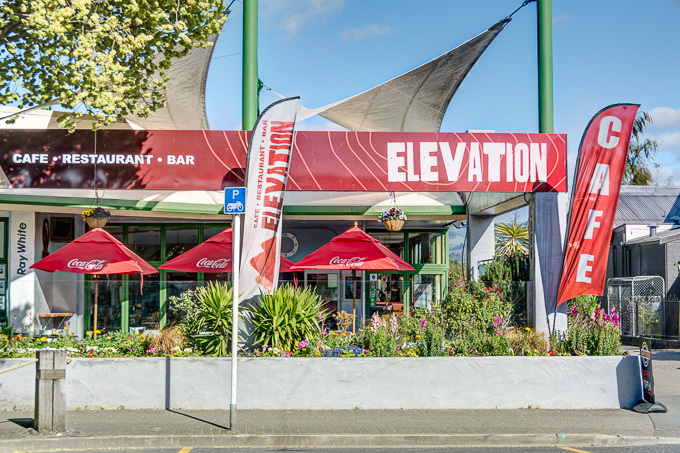 Centrally located on Motueka's main street, Elevation is committed to providing locals and visitors alike with great service and professionally prepared food, crafted with locally sourced ingredients. Why call it Elevation? In an area with so much emphasis on the national park to the north, owners Izzy and Andy chose instead to look west, to the Motueka Valley, Mount Arthur ranges and beyond to the Kahurangi. They have a deep respect for the mountains that are a constant backdrop in their daily lives, a sentiment that they know will resonate with many other locals. As well as alluding to the mountains in the name Elevation, Andy and Izzy's passion for the surrounding area is also evident in the décor. The bar top is crafted from miro, and its frontage is Baton Valley macrocarpa, inset with stones from the Motueka River. Combined with sumptuous booth seating and a relaxed ambience, Elevation provides an inviting dining experience at any time of day. By serving local wine and craft beer and locally sourced ingredients wherever possible, Elevation is serving up the best and freshest that the Tasman region has to offer. Izzy and Andy head a great team, with an emphasis on providing excellent service to each and every customer. Andy is a Motueka local, raised on the year-round abundance of seasonal produce that this area has to offer. Izzy grew up in Tapanui, surrounded by the Blue Mountains where her love of creating tasty seasonal food was born. For this pair, creating tasty dishes to be shared with friends and family is a time-honoured passion.